Start climbing at the bottom or the top. I have a special fondness for things that are unlike anything else. If you asked me what New Ice York is like, it would be hard to explain. I suppose it’s a puzzle game? I think time starts to loop in it, but by the nature of the game it’s hard to tell. 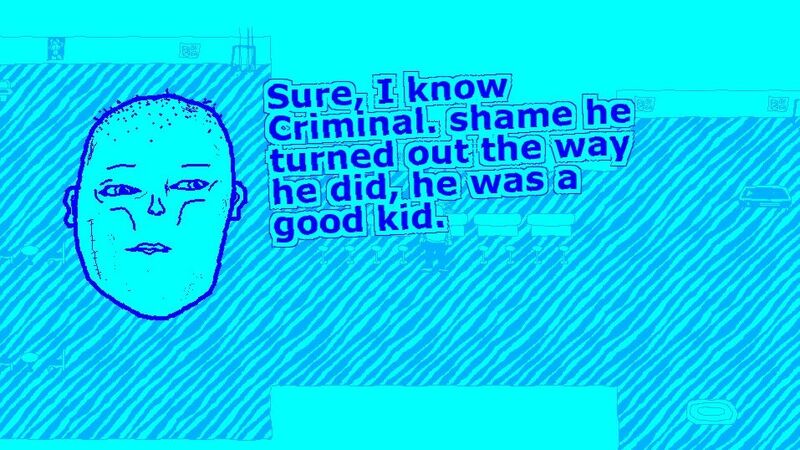 The main character is a detective with a cool haircut, but later he’s in a bus crash, and wears bandages. 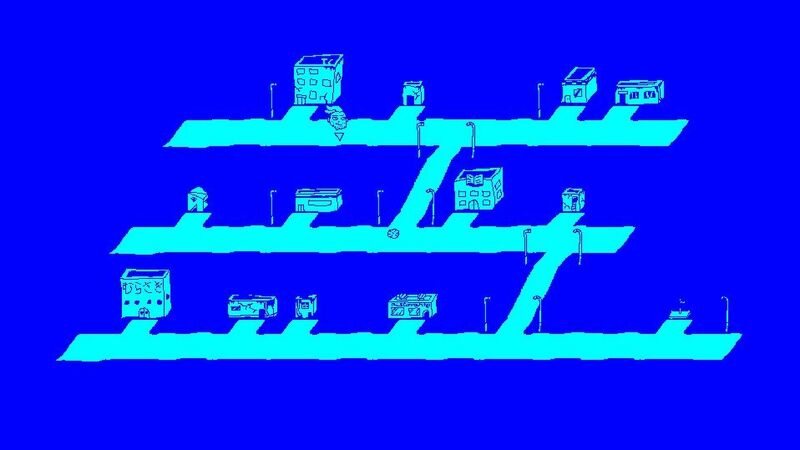 You use the arrow keys to walk around town and talk to people to figure out what’s happening. There are loads of extra, absurd bits – like playing a maze game whenever you have to find an item in your bag. It’s surprisingly funny all the way through. At one point you interview a criminal and it turns out his actual name is Criminal. Talk about nominative determinism, huh? Eventually it all seems normal. At first it all seems prohibitively odd, but you get used to it, even as the oddness increases. In the second half you beat up a really jacked dog belonging to a gym owner. There are sports mini-games and temporal portals. The way New Ice York is drawn is at once simplistic and detailed. It’s all like MS Paint but with extra effort and grubbiness. The product of one person’s head, without anyone else getting involved, can be really beautiful and strange. New Ice York is a bit of an incomparable one all together, really. When I was little I was really afraid of ladders; Bath Abbey may have been a contributing factor. Bath Abbey has a carving of Jacob’s ladder on the front of it. It’s probably supposed to be nice. But once I was told that angels can fall off. Jacob’s Ladder is the connection between heaven and earth that angels go up and down. New Ice York talks a lot about heaven and hell. I was trying to make sense of it for ages after I’d finished playing. There’s a bit in it where you climb a restaurant menu into the sky, and escape by falling. You should probably have a look at New Ice York, because I liked it a lot. Tagged with feature, magicdweedoo, New Ice York.